However, I won’t lie to you (it is Easter, after all) that they are a little tricky. And you may have some rolls that end up a little wonky. But, as my children oohed and ahhed over even the misshapen ones, I could see we had a winner idea. I made the bunnies with the whole wheat brioche dough, the challah dough, and the master dough. recipe (see below). The master dough made slightly better bunnies – the ears held their shape a bit better, but I will admit the brioche (see recipe below) made for a tastier treat (especially coated in sugar). Whichever dough you use, make sure it is very cold (chilled at least overnight). Cover (not airtight), and allow to sit at room temperature for about two hours. Note: Sometimes with brioche, with so much cold egg, if you don’t use warm enough water, the initial rise can be very slow. Professionals would fix this by letting the eggs come to room temperature, which solves the problem. You can do that, or just make sure that your final mixture of egg/butter/water is nice and warm (but not hot, or you can kill the yeast). The dough can be used as soon as it is chilled. This dough is way too sticky to use after the initial rise, but once it is chilled (at least overnight in the refrigerator) it is very easy to handle. The dough can be stored in the refrigerator for up to 5 days. 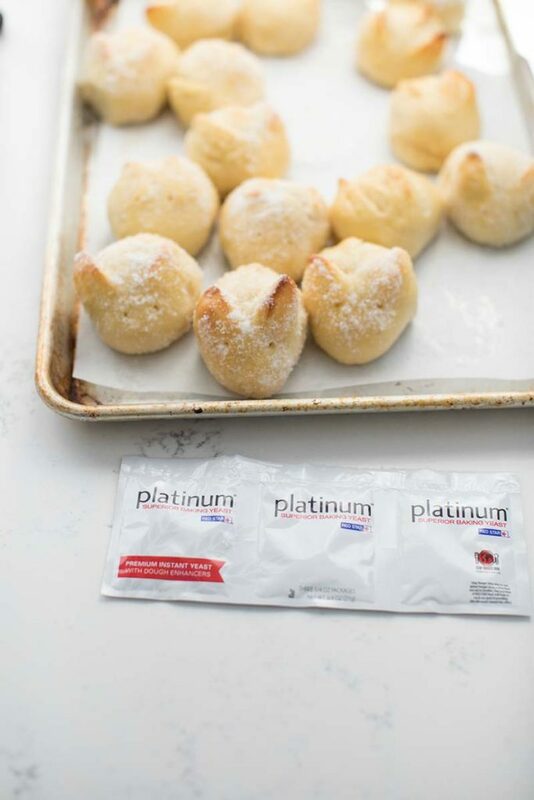 Preheat your oven to 350°F, and then line baking sheets with parchment paper. Remove 2 pounds of the dough from the refrigerator. Divide the dough into 2-ounce pieces, and roll into a ball on a lightly floured surface. (The rolls puff up quite a bit, and I found making them any bigger didn’t work well; the bunnies just looked very ‘blobby’.) Shape the dough into an oval, and then use a sharp scissor to cut the bunny ears. You want the ears to be a bit thick; if they are too thin they will bake right back into the roll without any shape. After snipping out ears, gently pull the ears back and round off the point (I’ve found this to be important, otherwise the ears shrink and take the shape of pigs or cat ears). Gently press the ears into the roll, but not too much or they will bake right back in. Gently brush the bunnies with egg wash, and then use the sharp end of a skewer or toothpick to poke eye holes. Use the dull end of the skewer to make ear indentations. You may have to do this a few times to make it stay. Place the baking sheet in the fridge for 15 minutes (this will help bunnies keep their shape) and then bake for 13-17 minutes until golden brown. Let the bunnies cool slightly on the baking sheet. 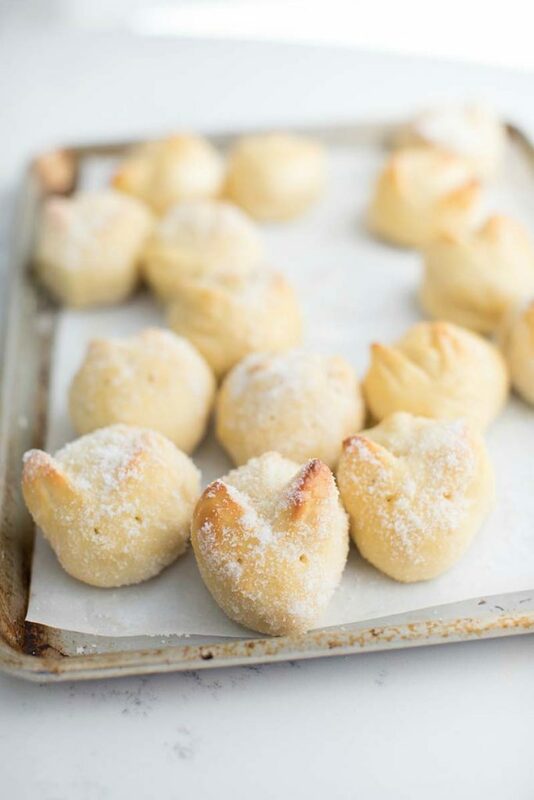 If desired, you can use a pastry brush to brush them lightly with melted butter, and then roll the bunnies into granulated sugar, or sprinkle them lightly with the sugar. You may have to re-poke the eye holes both after they come out of the oven, and after rolling them in sugar.